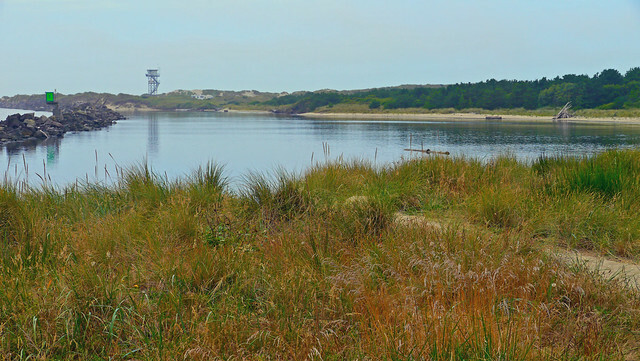 The north jetty on the Siuslaw River at Florence is a great place to do some diving on the Oregon Coast. At the west parking lot near the observation tower, a short jetty scramble leads to good spearfishing and crabbing. If you plan your dive with the tide, you can drift dive this site riding the tide out from the SCUBA Park to the east or head that direction if you ride the tide in. The main reason we dive this site is to go spearfishing and crabbing. While Crab Hole further east on the north jetty gets fished all the time, the further west part of the north jetty gets less hunting. We have done some drift dives here as well where we follow the tide back toward Florence. Florence, Oregon is just up the north jetty. From US101, head west on 35th Street. Take a right on Rhododendron Drive then take a left on North Jetty Drive. Follow North Jetty Drive all the way to the end. There is usually plenty of free parking right by the jetty. Check the signs to make sure the situation hasn’t changed, but we’ve never paid for parking here. There are a lot of options to dive this site. You can hop in at the SCUBA Park entrance and ride the tide as a drift dive to an exit at the west parking lot on the Florence north jetty. Or you can stick close to the west parking lot. Or you can head for the ocean and hop out along the jetty and walk back across the sand. The site runs east-west. Stick close to the jetty rocks. We haven’t found much of interest out in the channel other than a bunch of sand. As you get further west, conditions deteriorate. The dive becomes more advanced the closer to the tip of the jetty you get. If you run this as a drift dive, you can drift all the way back to Crab Hole. Watch for the big underwater pipe that marks the exit through the fish ladder. The main entrance/exit here is over the jetty at the parking lot. If you end up out toward the end of the jetty, you can hop out and walk back on the beach. If you head in toward Crab Hole, you can get out at the fish ladder. Just watch for the pipe underwater that leads to the exit. The further to the west you go, the rougher the conditions will get. At the entrance, you’ll probably find surf and some surge. Further to the west, you’ll run into much rougher conditions unless the sea is calm. Breakers routinely crash over the north jetty at the Y-shaped tip. The current can really rip going into or out of the Siuslaw River. If you plan your dive right, you can do a great drift dive from the parking lot in toward Crab Hole and then back out again to the parking lot. If you’re diving around low tide, you could head out on the last ebb of the low tide and then get pushed back into the river by the inrushing tide. However, this is a more advanced dive. We usually get 15-20 feet of visibility here. The bottom is heavy sand and doesn’t easily get stirred up. We’ve seen anywhere between 45F and 55F depending on the time of year. The water is usually calmer in the summer and fall here but the site is diveable any time of the year assuming that water conditions aren’t too rough. If they are too rough, try Crab Hole, or the Woahink west or east boat ramps. It’s usually around 35 feet deep at the bottom of the jetty although depending on what the Army Corps of Engineers is doing with dredging the center channel, the depth can vary. It would be a good idea to have advanced open water training for this site. 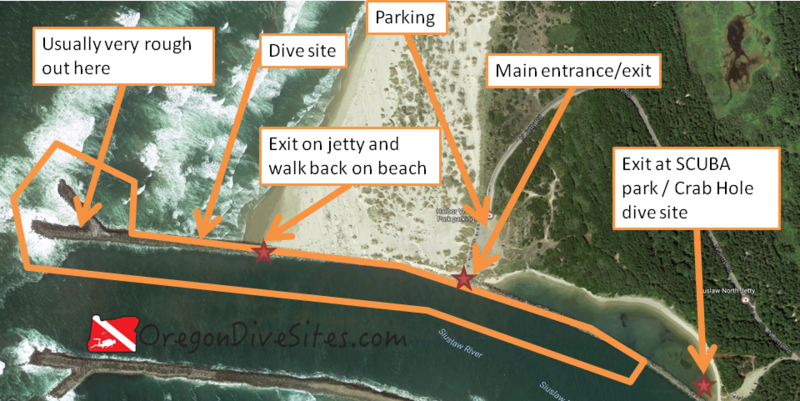 The eastern part of the site is diveable by less experienced divers but the western part of the site requires a lot of experience diving on Oregon jetties. We consider this an intermediate dive as long as you stay far enough inside the jetty. If you head west toward the tip, this becomes a very advanced and difficult dive. You can usually find parking right next to the jetty but sometimes you might have to walk 200 feet. Conditions can deteriorate rapidly at this dive site. The further west you go, the worse it can get. Be sure you know what you’re doing here. Don’t get sucked out to sea or pushed way up in the bay. We suggest flying a dive flag while you’re diving case anyone with a small boat ventures over toward the jetty to check out your bubbles. We have a dive flag we love and use all the time around Oregon over on our Gear We Use page. There used to be an air fill station in Florence but we heard that it is now closed. The closest place to get a full service on SCUBA gear and air fills is now Eugene. Florence’s old town on the waterfront has a lot of great restaurants. River otters along the Siuslaw River provide some great entertainment, too. There are several state campgrounds in the area that we have stayed at. We haven’t tried any of the local hotels so please let us know if you know of a good place for divers to stay the night.